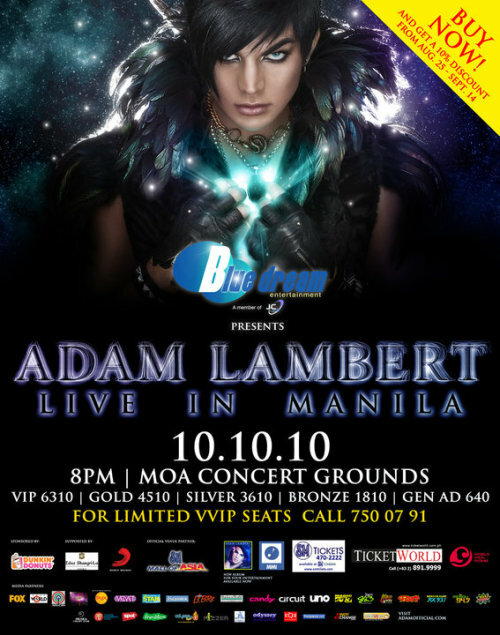 Hey all of you Adam Lambert of American Idol fans out there, here’s your chance to see him live on October 10! Actually, I heard that this concert has been moved for so many times already making his fans go more gaga with enthusiasm to see him perform live. And probably, ticket sales already doubled with the time extension that has been given for this concert. For sure, a lot of tweeners and young professional age groups will be mobbing this concert scene. I just hope nobody gets hurt just in case the crowd goes wild or anything… something that personal injury Tucson deals with after being hurt by the involve individual. Glam Nation Tour: Adam Lambert Live in Manila!